Casas Cantabricas offer both self-catering properties and delightful small hotels in the heart of the Picos de Europa, with walking and hiking straight from the front-door. Extending into Asturias and Cantabria, the Picos de Europa are amongst Europe’s most rugged and dramatic mountain ranges. The little market town of Potes, a centre for mountain excursions or activities and well supplied with shops, bars and restaurants, is nearby. Day trips include the cable car at Fuente Dé, walking the Cares Gorge or canoeing on the Sella or Deva rivers. Talk to our team of experts and let us help you find your ideal accommodation in the Picos de Europa mountains. With 25 years' experience in the area Casas Cantabricas offer a wide range of self catering and hotel accommodation in the Picos de Europa. 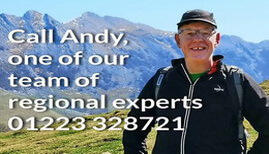 Call our friendly expert team and and let us help you get the most out of your holidays in this unique region where lofty peaks rise abruptly from sea level.